Excitement continues to build over the Sochi winter Olympics, and I’d venture to say that northern Canadians are perhaps more excited than our southern compatriots. That’s because we suffer from small-population-syndrome, which means that it’s a big deal when someone from one of the territories makes it onto the team. Simply being represented on a national team is a triumph against the odds. To put things into perspective: of the 221 athletes representing Canada at Sochi, Ontario, Quebec and Alberta have contributed the lion’s share of 163, or 73%. That leaves only 58 spots for the remaining 7 provinces and the 3 territories. Our sparse population also makes it more likely that the athletes are known around town, so people feel a more personal connection to them. Two Northwest Territories athletes will be heading to Sochi: Michael Gilday, a speed skater from Yellowknife and Brendan Green, a biathlete from Hay River, a town on the southern shore of the Great Slave Lake. Biathlon has always struck me as an event that might have started as an alcohol-influenced dare. It just seems to me that skiing and shooting make for a strange combination into one race, but what does my non-Olympic self know? Then there’s Jesse Cockney, a cross-country skier from Canmore, Alberta. He was born in Yellowknife, and although he moved to Canmore at the age of 7, in true Canadian fashion, all that’s needed is a sliver of a connection to claim him as “one of us”. To show our territorial solidarity, we also rejoice that Emily Nishikawa, a cross-country skier from Whitehorse in the Yukon, rounds out the northern flank of the team. My crystal ball tells me that there will be many northern eyes glued to TV screens during the Olympics next month. Those of us who didn’t make the cut for the team get to stay at home and play games in the snow. January 19th was World Snow Day, a day dedicated to the promotion of snow sports. This year, Mother Nature obliged by gifting us with gentle and generous snowfall during the days leading up to the event. There were several activities to mark the occasion. Outside City Hall there was skating on the outdoor rink, and snow volleyball and ultimate frisbee in the snow-covered park. At the Ski Club there was cross-country skiing and snowshoeing, and pick-up ice hockey on frozen Yellowknife Bay. 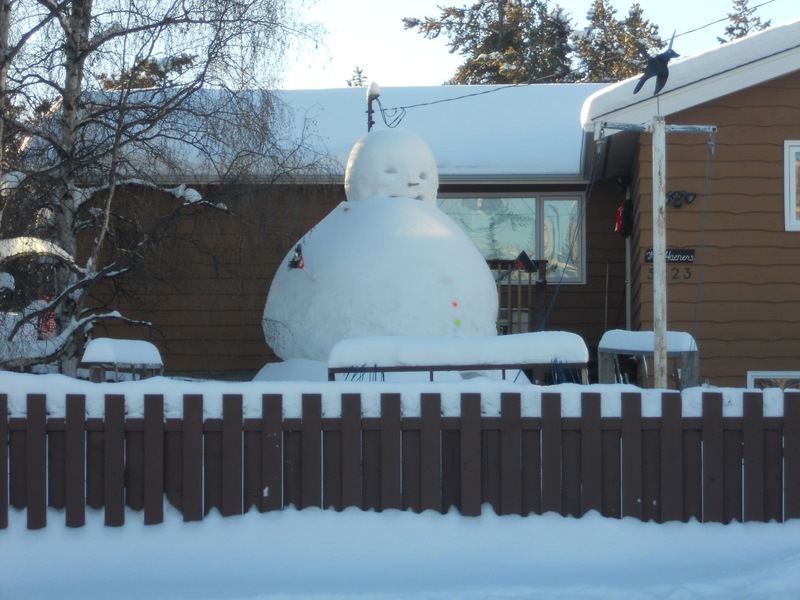 Not specifically for World Snow Day, but somewhat related, I noticed this giant snowman one day, literally as big as a house. I wonder how long it took to build. One thing’s for sure: Yellowknifers don’t need an official day to get out and have some fun in the snow. When you need to rest your weary body from the glut of outdoor activities, indoor entertainment beckons. There was a rumble at the hockey arena: Guy LaFleur and a team of ex-NHL players rolled into town to take on the best of our best in the RCMP and Fire. I took a pass on that excitement because I’m not a hockey fan, which, I’m told, is positively treasonous. Now that my secret is out, I expect Immigration officers to arrive soon, to revoke my citizenship and deport me. At this time of year, I actually might not mind too much. 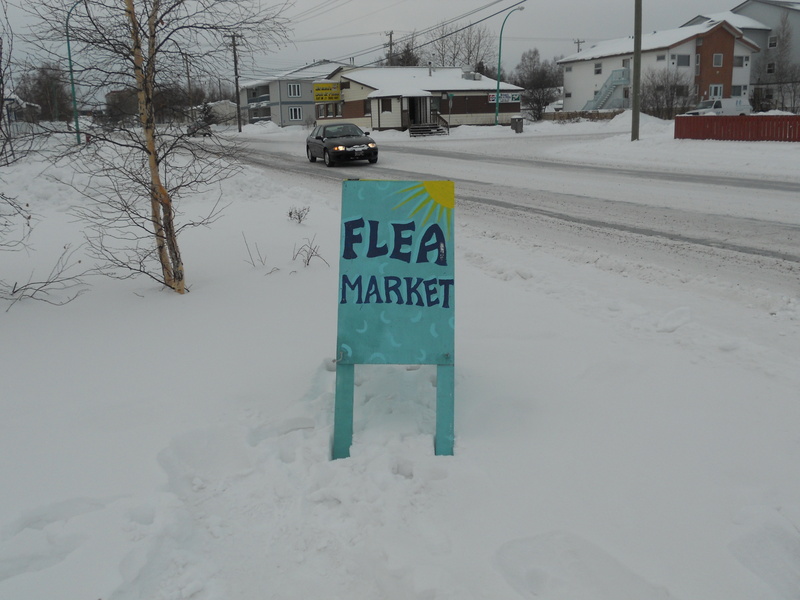 After sitting in a cold hockey rink, you might want to warm up by browsing at the flea market. It’s run in the parish hall of St. Patrick’s Catholic church. It seems to be one of those community affairs that everybody knows about, because I’ve never seen an advertisement for it anywhere. I simply happen to pass by the church frequently, so I’ve seen the sign outside. 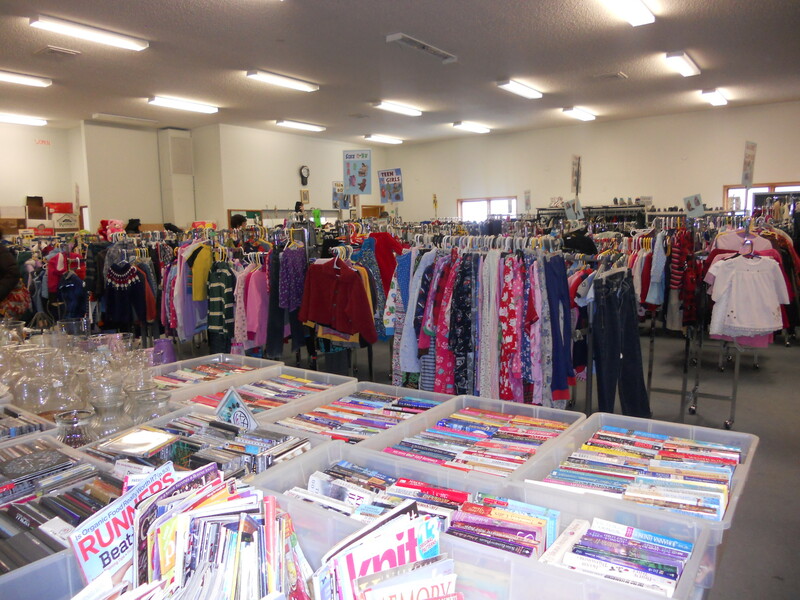 Inside, it’s a bargain-hunter’s paradise. This is where Yellowknifers take items that they no longer want. 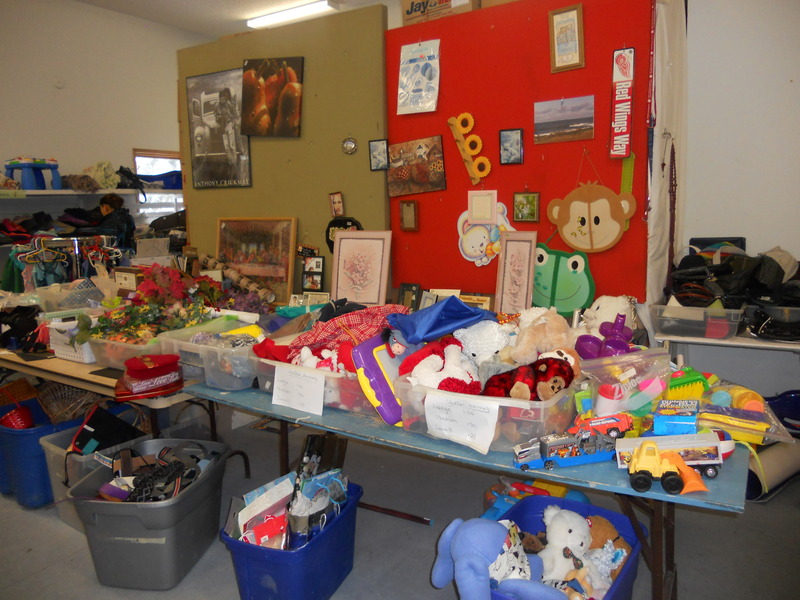 In this town, there are a few choices: the dump, the Salvation Army or the flea market, which helps raise funds for the church. There’s some of everything in there: clothing for the entire family, glassware and other kitchen items, skis, books, magazines, movies, pictures, toys, the odd humidifier or toaster oven, copious knick-knacks and stuff that you might not even know what it is. 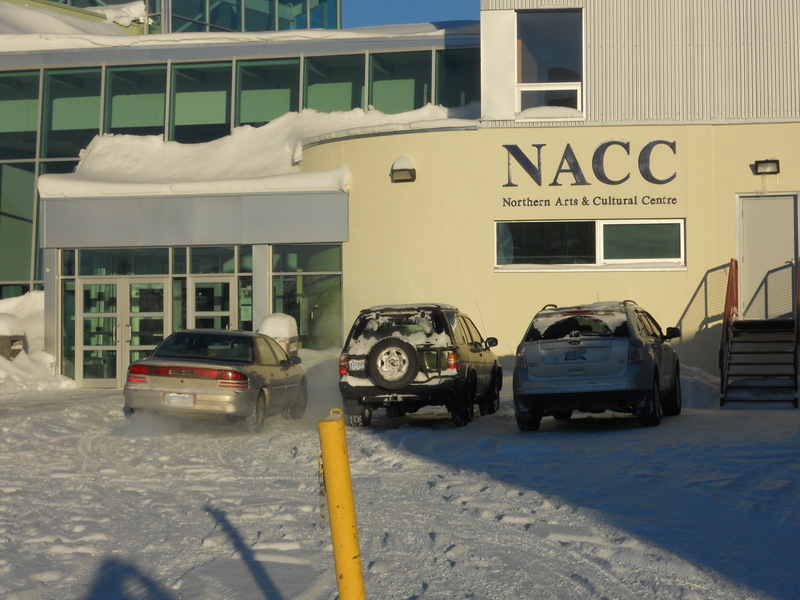 If flea markets are not your thing and you want to take in a bit of the cultural scene, there’s always something on stage at the Northern Arts & Cultural Centre (NACC). The name sounds rather grand, but it’s more fondly called “Nak”, and it’s essentially our only performance theatre. Given its importance, its location might be considered odd: tucked rather unobtrusively at the back of one of the high schools. If you’re new to town, you might wonder if it’s meant to be a town secret. I prefer to chalk it up to the efficient use of space. It was renovated a year or two ago and it’s nicely appointed, with about 300 seats. Like any theatre, they’re always open to donations, or you can choose to leave your mark forever with the gift of a seat plate. 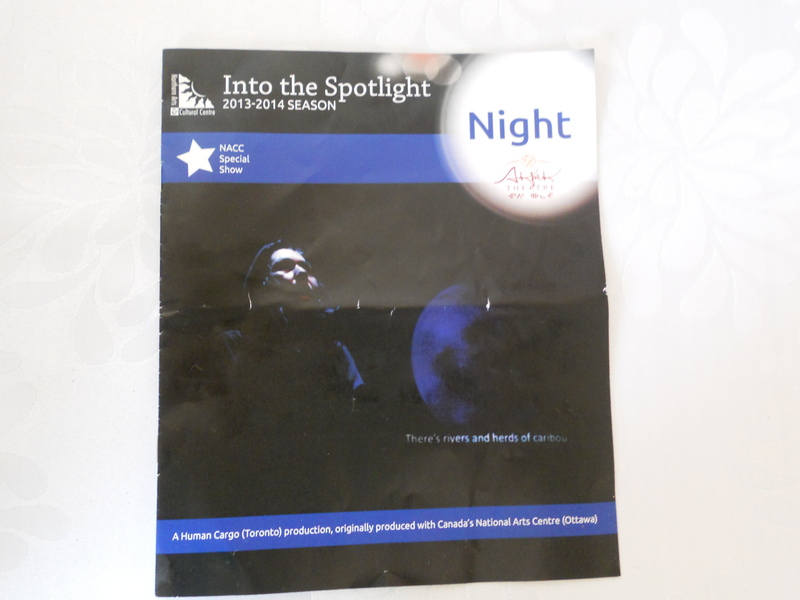 This month, the play Night was onstage for two nights. It was put on by Human Cargo, a Toronto-based theatre company, and Yellowknife was only one of many stops on its tour around the country. I don’t want to give too much away, but any outstanding play deserves more than passing mention. The setting is the town of Pond Inlet, on Baffin Island in the territory of Nunavut. It takes place during the winter, so much of the set is in darkness. It depicts – in an unvarnished fashion – life in the far north, with all that entails. It touches on traditional customs and way of life in an extreme environment, and on the attitude of southerners toward northerners, and vice versa. No work about the north would be honest if it didn’t portray the effects to this day of a history of terrible, inhumane treatment of those who were here first, (a shadow that hangs heavily over this country, whose presence I feel much more in the north than down south). It also contrasts the good-natured humour of northerners with the scourge of high suicide rates, from which Nunavut suffers by far the highest in the country. In short, it raises a lot of issues that people generally don’t like to discuss. It was done in a smooth-flowing combination of English and Inuktitut, with English subtitles cleverly projected onto a screen. It’s a thought-provoking tale and most probably it will be received very differently by northern audiences vs those in the south. Overall, it’s an exceptional production and I encourage you to see it if you ever have the opportunity. There were all kinds of other events going on this month, some of which I may not even have known. That’s probably beneficial, because I can’t possibly go to everything. In short, if you think that life in The ‘Knife is dreary and blah in January…perish the thought!